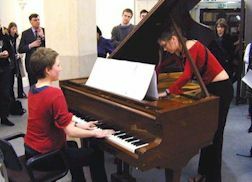 Johanna and Sarah first met Susan in November 2002 after she had contacted Trinity College of Music, in search of female composers for an exhibition in conjunction with International Women's Day. The composers themselves wrote the whole work as a joint composition. This rather unusual situation worked surprisingly well in supporting and developing each other's ideas. The work is based on the Female and is divided into two sections: the Mind and the Body. For one piano with two players. For two live Bb clarinets and compact disc. An entirely programmatic work charting the development of the female from puberty to motherhood. 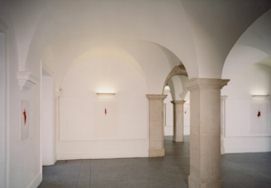 Its collage of textures and soundscapes are designed particularly to be absorbed whilst viewing the paintings.